If you are comfortable with the job description, the location and any uniform requirements, you don't need to worry if you can't reach the client. The client isn't always expecting to hear from you and they will know you're confirmed to work the shift. It's business as usual! 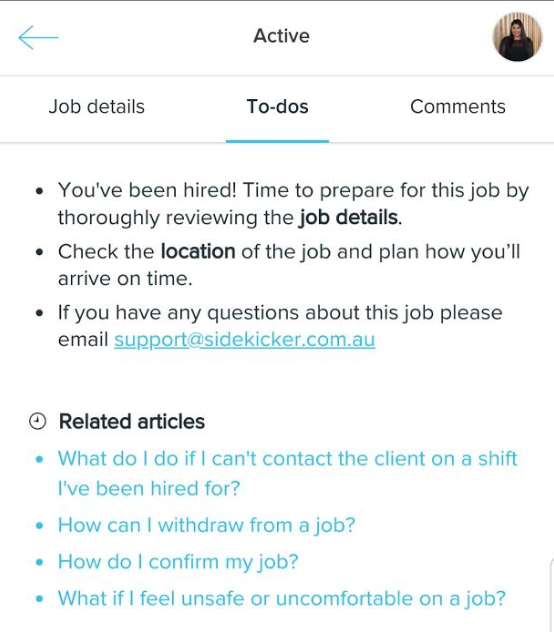 If you are unsure of any of the shift details or just need some clarity, don't hesitate to reach out to our support team via the blue Sidekicker chat bubble. If we can't answer your question, we'll be in touch with the client. Don't worry, we'll make sure you're 100% confident with everything before your shift. Remember to familiarise yourself with the job description. You won't always receive direct correspondence from the employer but be sure to make yourself reachable in case they do try and contact you. Regardless of whether or not you are contacted by the client before your shift, you are always expected to turn up. If you have any queries or concerns at all, we're always available via the blue Sidekicker chat bubble.